The holidays are over, and I’ve finally gotten back to edit-listening to the audiobook-in-production of A Dead Guy At The Summerhouse. Here’s part of what I listened to yesterday. The narrator is Mitch Franklin, 17-year-old orphan, hired to tend wealthy eccentric Amelia Hardesty’s two Pekingese dogs. I’ve been razzed about it all my life, but I love flowers. In the last school yearbook, I was voted Most Likely to Marry a Girl Named Daisy. Now I drank in the colors and shades, the shapes of the flowers and of the plantings, the curves of the pebbled paths and the slanting afternoon sunlight on it all. The dogs, in what must have been a rehearsed move, jerked their leashes out of my hand and took off like fuzzy bullets. I took off after them, praying they’d keep to the paths: I might just have to kill them, if they tore through a flower bed. One leash or another snapped off a bloom here and there, but the destruction was minimal; the dogs themselves stayed on the pebbles until they reached the end of the garden. They dove into the woods. I dove after them. The undergrowth had been cleared in an eight-foot swathe, making a sort of informal path. I followed it and the runaways into a clearing. In the center of the open ground, a small, once-white building threw its shade across a bed of primroses. Perfect. That was all this place needed, was a summerhouse or a gazebo or whatever you call these things. But why was it all run-down, with yellowed paint peeling off its sides, shingles missing, lattices cracking from the weather? Behind it, a small stream gurgled past. I circled the summerhouse to get a better look at the water. And saw the grave. The headstone read: ALBERT ALAISTER. 1916-1963. HE IS NOT DEAD, BUT SLEEPETH. Gee, I missed the orphanage. 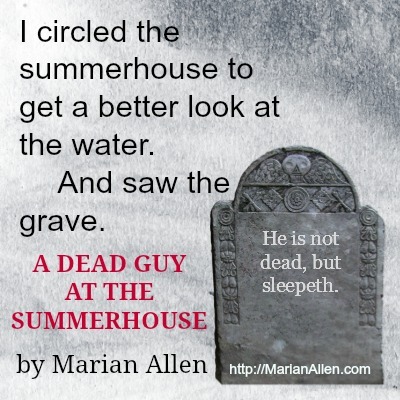 A Dead Guy At The Summerhouse is available at Amazon in print and for Kindle or by order from your friendly neighborhood independent book dealer. Cover art by Sara Marian. A WRITING PROMPT FOR YOU: A character is shocked by a grave. This entry was posted in A DEAD GUY AT THE SUMMERHOUSE, Sample Sunday. Tagged NA, novel excerpt, paranormal, suspense, YA.